The Obama era officially ended Friday amid protests in Washington and across the world over his Republican successor's rise to power. Here's what happened and what you need to know moving forward. Donald Trump is sworn in as president on Jan. 20, 2017. Donald Trump is now the 45th U.S. president after he was administered the oath of office on Capitol Hill in Washington on Friday. In his inauguration speech, he promised an era of “America first” policies, issuing a blunt warning to other countries that he plans to “buy American and hire American.” Here are the key moments from Mr. Trump’s inaugural address, annotated. Room is quiet here at the Canadian embassy. No one clapping along to President Trump's pledge to put the US-first. Although much of the day was devoted to pomp and circumstance, Mr. Trump moved quickly to establish policy priorities. His first major policy action was to target the Affordable Care Act, his predecessor’s signature health-care law. Mr. Trump signed an executive order that allows the Health and Human Services Department and other federal agencies to delay implementing any piece of the law. The administration is making the defeat of Islamic terrorism its top foreign policy goal. Mr. Trump also vowed to end the reliance on foreign oil with an ’America first’ energy policy (subscribers) that wants to expand fossil fuel production and reverse Obama-era climate change regulations. 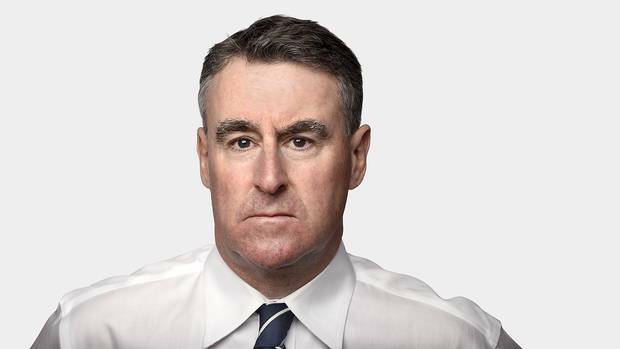 Mr. Trump declared the era of co-operation over in international trade, a move that sent reverberations across Canada and other major trading partners. Canadian officials, however, put a positive spin on Trump’s protectionist rhetoric. Police clashed with protesters and made more than 200 arrests, after black-clad activists smashed store and car windows in a gathering downtown. Police in riot gear responded with pepper spray and stun grenades. Earlier in the day, several peaceful protest groups attempted to block entry to security checkpoints. Some Canadians who were attempting to travel to the U.S. for the inauguration or a march on Saturday were turned away at the border by officials. On Capitol Hill, the U.S. Senate approved two of Mr. Trump’s cabinet nominees, retired Marine Generals James Mattis and John Kelly. Mr. Mattis was named Secretary of Defence while Mr. Kelly was appointed Secretary of Homeland Security. Globe in dc The members of the crowd on the Washington Mall we spoke to at Donald Trump’s inauguration were excited, with high hopes for the incoming President. Presidential inaugurations are carefully scripted pageants and displays of power. Of all the traditions that have accrued around them since the 18th century, only one is required in the Constitution: The president swears this oath of office. 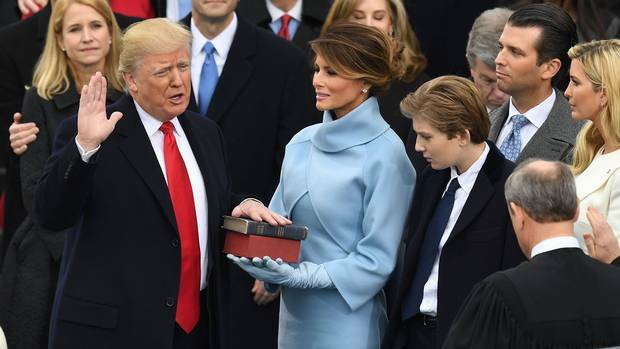 I do solemnly swear [or affirm] that I will faithfully execute the Office of President of the United States, and will to the best of my ability, preserve, protect and defend the Constitution of the United States. Mr. Trump was sworn in by Supreme Court Chief Justice John Roberts with two Bibles: His own, a gift from his mother, and the one Abraham Lincoln used at his first inauguration in 1861. Minutes earlier, Mr. Trump's Vice-President, Mike Pence, was sworn in by Supreme Court Justice Clarence Thomas. Vice President Mike Pence is sworn in as his wife, Karen, holds the Bible. Hillary Clinton, Mr. Trump's Democratic rival in the 2016 election, was present for Friday's ceremony, saying she was attending to "honour our democracy." Ms. Clinton was later seen shaking hands with Mr. Trump at the inaugural luncheon. Newly sworn in President Donald Trump shakes hands with Hillary Clinton at the inaugural luncheon at the Statuary Hall in the Capitol, Friday, Jan. 20, 2017, in Washington. In photos: The inauguration of Donald Trump Take a closer look at the pomp and ceremony surrounding the swearing-in of the 45th president. 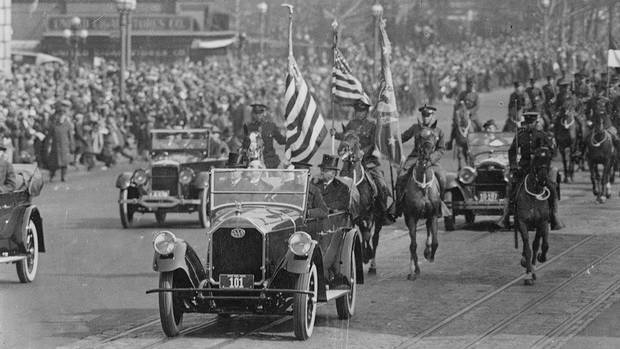 In photos: U.S. presidential inaugurations past Ceremonies have evolved since George Washington’s simple New York City ceremony on April 30, 1789. Mr. Trump began his inauguration speech on a conciliatory tone, but quickly shifted into the doom-and-gloom rhetoric that helped propel him to office. Thanking the Obamas for a gracious transition of power ("they have been magnificent"), he said the day "will be remembered as the day the people became the rulers of this nation again." He then blamed "the ravages of other countries" for damaging the U.S. economy and destroying jobs, and warned the world to expect a new protectionist reality. We will bring back our jobs, we will bring back our borders, we will bring back our wealth and we will bring back our dreams. ... From this day forward, it's going to be only America first. America first. 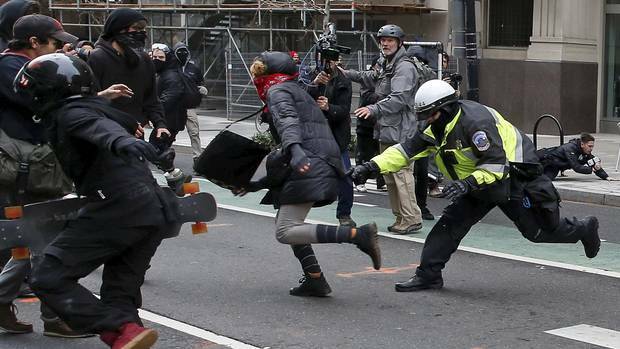 A police officer tries to tackle an anti-Trump protester on the sidelines of the inauguration. Anti-Trump protesters turned out in force in Washington on Friday morning. Spirited demonstrations unfolded peacefully at various security checkpoints near the Capitol. But about an hour before Mr. Trump was sworn in, police gave chase to a group of protesters who smashed the windows of downtown businesses as they denounced capitalism and Mr. Trump. Police in riot gear used pepper spray from large canisters and eventually cordoned off the protesters. #disruptJ20: A movement of counter-protests in Washington and other cities on Friday. Love-a-Thon: A three-hour Facebook Live broadcast on Friday raised funds for the American Civil Liberties Union, Planned Parenthood and other groups. #NotMyPresident: A social-media campaign and a silent protest during the inauguration. National General Strike: A campaign of walkouts and civil disobedience on Friday. The protests don't end on Friday, however, as Saturday is expected to see the biggest demonstrations as part of the Women's March on Washington: A broad coalition of feminist and anti-racist groups that's expected to bring hundreds of thousands to the U.S. capital. On the pro-Trump side, there were the Deploraball parties on Thursday and Friday in Washington and other U.S. cities. The name was a reference to when Mr. Trump's Democratic rival, Hillary Clinton, said during the campaign that half of Mr. Trump's supporters were a "basket of deplorables." The White House said members of the residence staff presented the Obamas with two American flags that were flown atop the building. One was flown on the first day of his presidency; the other was flown on his final morning as president. After the inauguration, the Obamas left the Capitol in a military helicopter. Mr. Obama addressed a staff gathering at Joint Base Andrews before departing for a vacation in California. "You proved the power of hope," he said. Mr. Obama waves as he boards a helicopter to depart the U.S. Capitol after the inauguration. 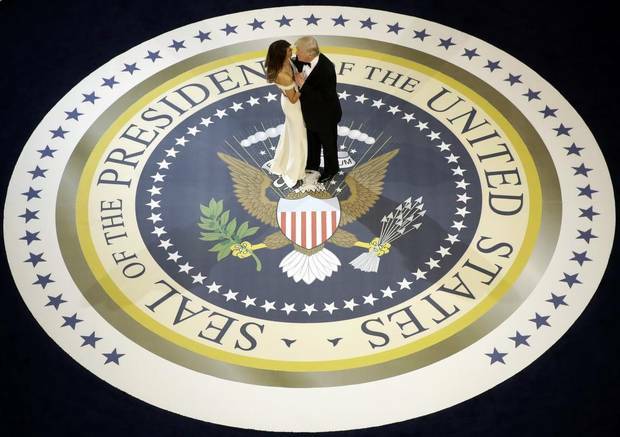 President Donald Trump dances with first lady Melania Trump, at The Salute To Our Armed Services Inaugural Ball in Washington, Friday, Jan. 20, 2017. 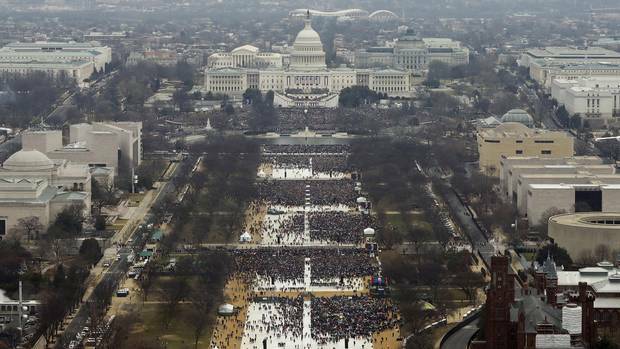 Despite Mr. Trump's appeals for a record turnout, crowds paled in comparison to the last two inaugurations. An estimated 1.8 million and 1 million people came to the National Mall for Mr. Obama's inaugurations in 2009 and 2013, respectively. 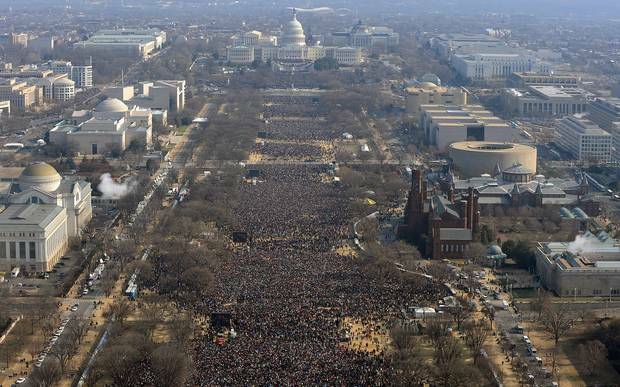 Here's how the National Mall looked Friday, compared with Mr. Obama's 2009 swearing-in. Jan. 20, 2017: The National Mall at Mr. Trump’s inauguration. Jan. 20, 2009: The National Mall at Mr. Obama’s first inauguration. Mr. Trump's supporters have been arriving in Washington since earlier this week to celebrate the man who promised he'd "Make America great again." #Trump supporters from Tennessee. "I think he's connected with the American public like we've not seen in a long time," says Wendy Boles, on the left. One of the most coveted viewing spots is the sixth-floor terrace of the Canadian embassy, which lies on Pennsylvania Avenue between the White House and the U.S. Capitol. The embassy held an invite-only party for about 1,800 people on Friday. Canadian embassy in DC On the day Donald Trump was sworn in as America’s 45th president, the Canadian Embassy held festivities to mark the occasion. 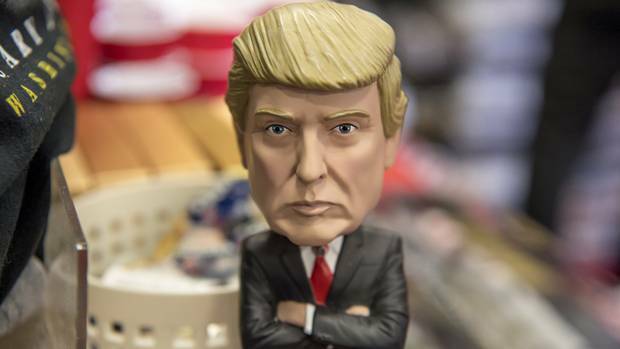 In photos: Trump inauguration memorabilia for sale From T-shirts to buttons and bobbleheads, vendors are hoping to cash in on Inauguration Day. 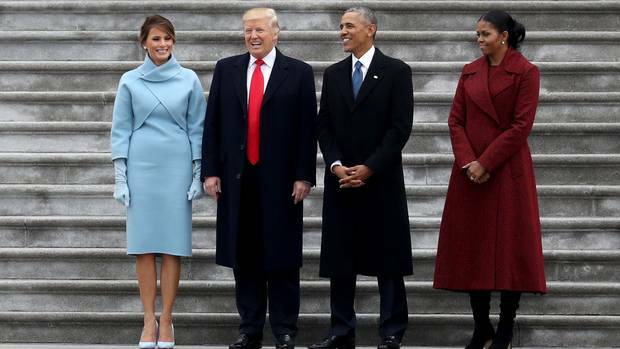 If you were expecting the star power of Barack Obama's 2009 inauguration day – whose guests included Beyoncé, Oprah Winfrey, Tom Hanks and Tiger Woods – prepare to be disappointed. A-listers (and even D-listers) of music and film have mostly decided to skip Mr. Trump's inauguration, and several acts who committed to perform have since cancelled. Those who were left at Friday's inauguration included teenage reality-TV singer Jackie Evancho and some of the Mormon Tabernacle Choir. Jackie Evancho performs the national anthem as Vice-President Mike Pence and President Donald Trump watch. The night before the inauguration, only about 10,000 people turned out to a concert featuring alt-rock band 3 Doors Down, actor Jon Voight and country singer Toby Keith. On Inauguration Day, Globe journalists visited a town in one of the red states that propelled Mr. Trump to victory: Ottawa, Ohio, the seat of a county where almost 80 per cent of residents voted for Mr. Trump last fall and chronicled the story on Instagram: @globeandmail. Globe feature writer Ian Brown took a road trip to Washington, passing through a stretch of the U.S. rust belt in Pennsylvania that played a major role in electing Mr. Trump. Here's what he learned from American voters along the way. Mr. Trump's rise to power was greeted with both praise and condemnation around the globe, as Americans usher in a new president who promises to turn the superpower's foreign policy, military alliances and trade commitments upside-down. Canada: Prime Minister Justin Trudeau issued a statement congratulating Mr. Trump, touting the economic ties between the countries. Canada and the United States have built one of the closest relationships between any two countries in the world. This enduring partnership is essential to our shared prosperity and security. ... We look forward to working with President Trump, the U.S. Administration, the 115th Congress, and officials at the state and local levels to restore prosperity to the middle class on both sides of the border, and to create a safer and more peaceful world. Canadians saw several anti-Trump protests on Friday, with more planned for Saturday in solidarity with the Women's March on Washington. Anti-Trump protesters burn an effigy of Donald Trump in the streets of Montreal on Friday. Russia: Russian officials and lawmakers lauded Mr. Trump's inauguration, hoping it will herald a period of better ties with the United States. 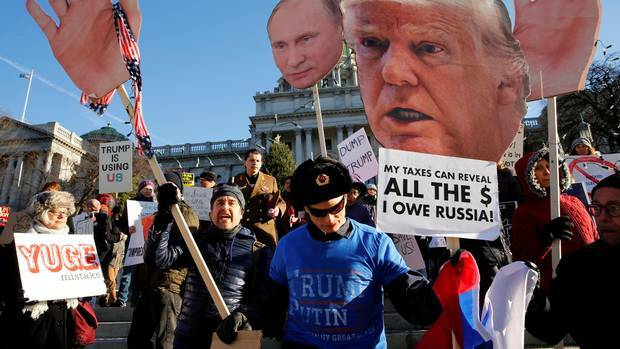 A hundred Trump sympathizers, nationalist activists and spin doctors gathered at a hipster party location several hundred meters away from the Kremlin to celebrate. Russian President Vladimir Putin and the Obama administration were in a tense standoff over Moscow's military incursions into eastern Ukraine, but Mr. Trump has made consistently warm overtures to Mr. Putin, while also facing allegations that Russian hackers meddled in the election that brought him into office. Traditional Russian matryoshka dolls depicting Russian President Vladimir Putin and Mr. Trump are displayed for sale at a street souvenir shop in St. Petersburg on Friday. Asia: Mr. Trump's presidency is being viewed with caution in some parts of Asia. He alarmed China by breaking with decades of precedent last month by taking a congratulatory telephone call from Taiwan's President Tsai Ing-wen. Mr. Trump has also criticized China's trade practices and threatened to impose punitive tariffs on Chinese imports. Protesters burn a mock U.S. flag and a real one during a rally at the U.S. embassy in Manila on Inauguration Day. Left-wing and Muslim activists have asked President Rodrigo Duterte in a noisy protest to keep his promise of charting a foreign policy independent of the United States by staying away from Mr. Trump. Team Trump: Congress has already began to confirm his cabinet picks, whom they've been screening in hearings since last week. The swearing-in also begab the complicated handover of the White House staff and federal bureaucracy from Mr. Obama's administration to Mr. Trump's. Diplomats: Washington will have to pick a new ambassador to Canada after the former one, Bruce Heyman, resigned under orders from the Trump administration that all of Mr. Obama's politically appointed envoys step down. Canada: Ottawa has been preparing for weeks to deal with a new president whose policies clash with Prime Minister Justin Trudeau's on trade, climate change and immigration, among other issues. Mr. Trudeau has shuffled his cabinet to deal with the new Trump administration (read the full list here). Here's more background on Chrystia Freeland, the new Foreign Affairs Minister; Andrew Leslie, the former general Mr. Trudeau is promoting to forge closer ties with the ex-soldiers in Mr. Trump's inner circle; and some of the key match-ups to watch between Mr. Trump's cabinet and Mr. Trudeau's. 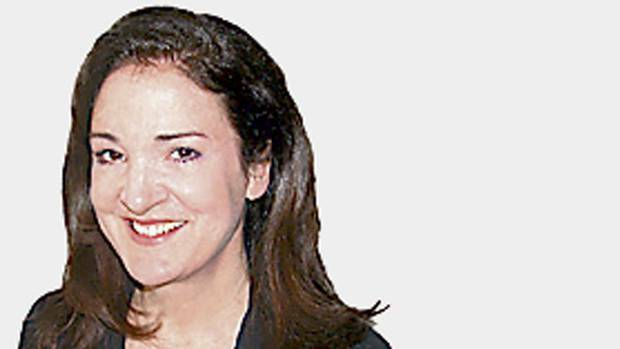 Elizabeth Renzetti: On inauguration day, presidents always took the high road. Not Donald Trump Fairy tales are for multiplexes, not for the steps of the Capitol, where three former presidents sat and listened to his dark and menacing speech. 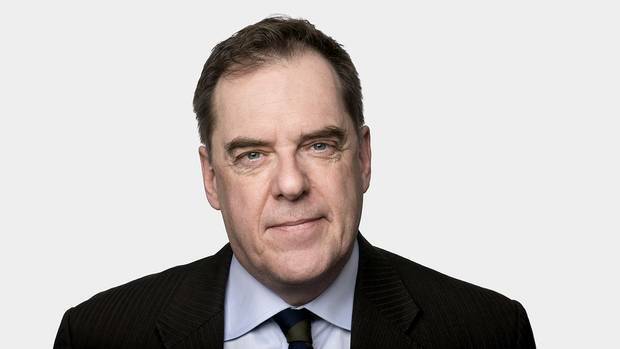 John Ibbitson: Fear Trump, but have faith in the endurance of U.S. institutions Trump’s raw populism will not easily dismantle the legacy of his predecessors. John Doyle: Inauguration TV: A divided nation severed by a very divided media Inauguration coverage is a reminder that world is still run by older white men with comb-overs and decades-younger wives. 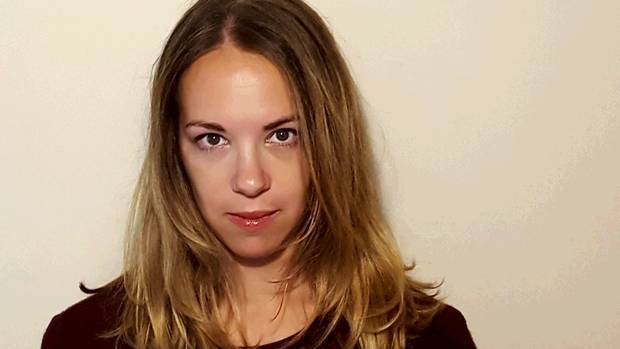 Sarah Kendzior: Our anti-American president I was right about Trump’s win, but I was wrong about how much the United States still had to lose. 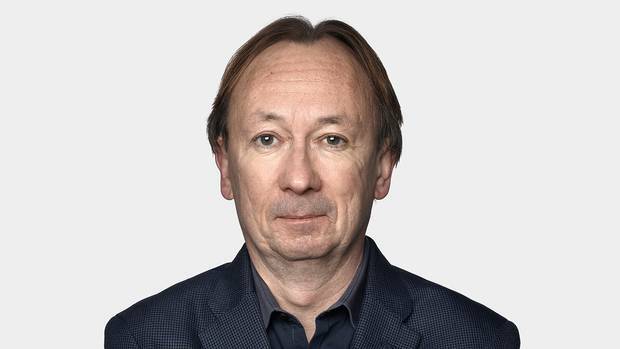 Barrie McKenna: Trump's pledge to put America first leaves Canada behind on jobs and trade (for subscribers) Trump’s vow to America people could doom Ottawa’s efforts to persuade his team to spare Canada from proposed border taxes. Editorial: Keep calm and carry on, world It behooves critics of Mr. Trump, now that he is in power, to stop setting on fire the few hairs we haven’t already pulled out of our scalps, and to take a deep breath. Leah McLaren: Why I'm bringing my four-year-old son to a feminist march against Trump This is what a feminist looks like: A little boy in an oversized T-shirt at a women’s march in London. What could be more hopeful? 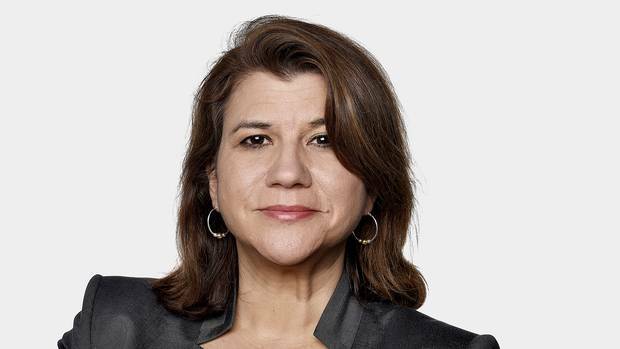 Sarah Hampson: Women’s March on Washington sheds light on the problem with feminism The organizers behind the Women’s March on Washington have presented themselves as the face of contemporary feminism. That, unfortunately, is a sort of fake news. 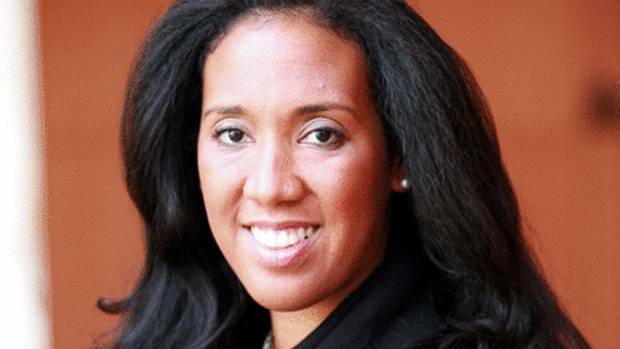 Can Donald Trump fix his relationship with black America? Mr. Trump must realize that his charged rhetoric and thoughtless, uncontrolled tweets have given blacks a very jaundiced view of him. 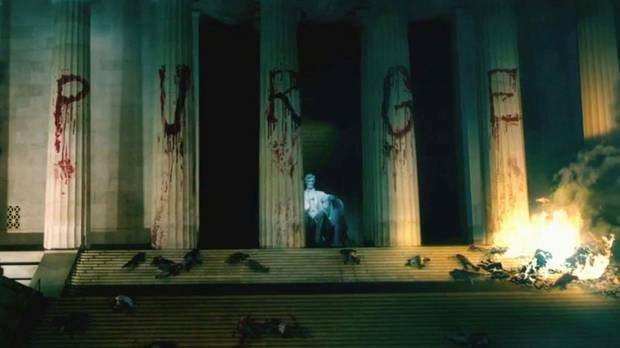 Trump and The Purge films, together at last We can’t even compare Trump’s America to the cartoonish near-future of the Purge films because he’s already doing it himself, John Semley writes. In Trump’s Washington, fractured feminism faces a reckoning Feminists are planning large inauguration protests, but the sisterhood may be more divided than united. 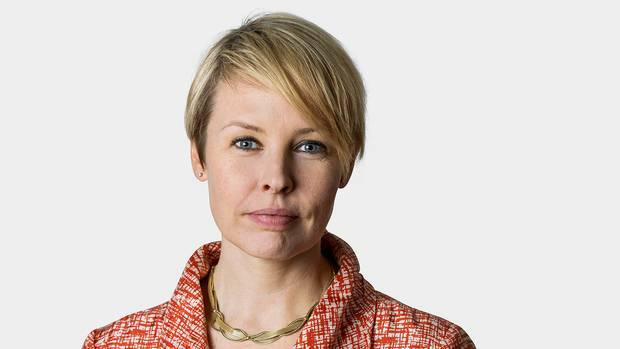 Simona Chiose takes the political pulse on university campuses. Donald Trump’s rise shows how life can alter fiction Novelist Olen Steinhauer details how an attempt to write a story about homegrown left-wing terrorism in America was derailed by a sea change in the body politic.